Supporters of Canada post, with their pets and children, make their way out of Bell Park. 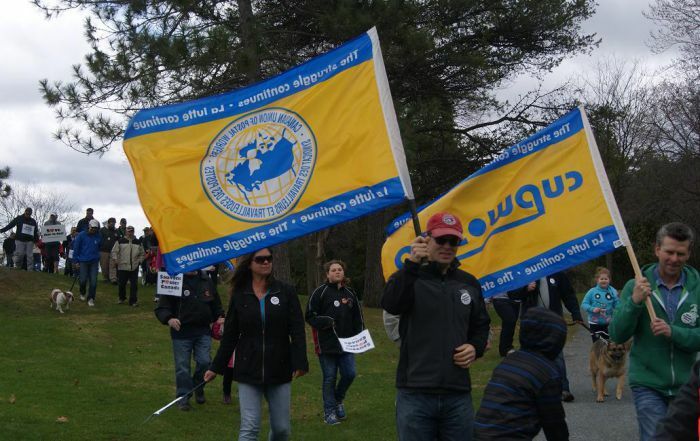 Beautiful yellow and blue flags were carried during the "walking for our postal carriers" event. About 70 Sudburians, plus pets and children, gathered today at Bell Park. They walked from Bell Park along Paris into downtown Sudbury with signs and flags before returning to the park for a BBQ. The event was organized by the Canadian Union of Postal Workers (CUPW). 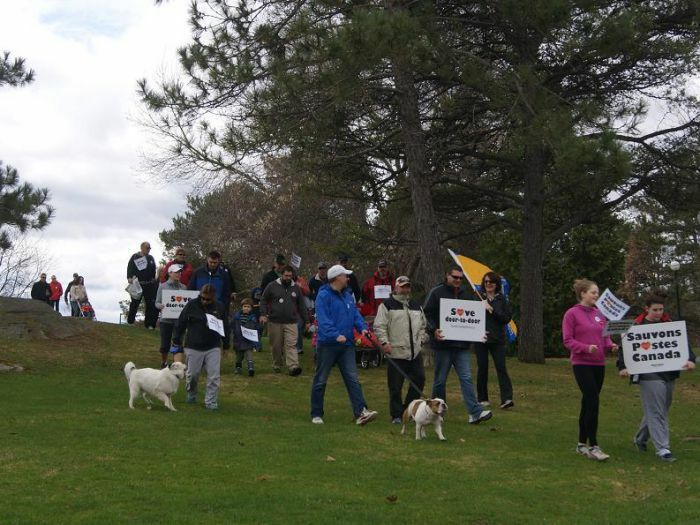 "I enjoy my job, and enjoy the conversations I have with people on my walk during my day," said Nancy Legault, one of the organizers of the event. "Losing 7000 jobs will hurt everyone, people will lose a great service, and our children will lose the chance of working these good jobs." Postal worker Phil Marsh says "The postal service is an essential public service making sure the mail is accessible for everyone. No other G7 country has eliminated door to door delivery. It is just another austerity measure where government is taking money out of publice service and putting that money into the pockets of CEOs of large corporations." The crowd included NDP MP Glenn Thibeault (who made his support for door to door public with a community canvas back in March) and provincial Liberal candidate Andrew Olivier who said: "As a person with a disability, I think it is imperative to keep door to door service and support our postal workers. These front line staff is the strength of Canada post." Not everyone there were politicians or postal workers. Racheal Charbonneau was among the small group of people there simply to build solidarity between different causes and she expressed her frusturation to me afterwards: "When Phil [Marsh] began to speak, there was an alarming amount of grumbling from different members of CUPW about Phil, and even semi-serious threats they would leave. When Phil asserted he would take the time needed because Canada Post is an important issue, one member said, “Bye Phil.” I was glad I got to see these attempts to suppress a more radical voice myself, but I was surprised how comfortable these members were engaging in such open non-solidarity. When Phil began by acknowledging the land we were gathered on, many members and their families turned away and began conversing loudly in an attempt to ignore Phil. When Phil expressed solidarity with those living in poverty, he was also ignored. Even anti-Harper statements, which can usually be relied on for populist reactions, did not receive much approval. The most enthusiasm seemed to be reserved for the struggle they are preparing to engage." The group is looking for people to sign a petition in support of door to door delivery, and they are planning on doing more meetings and walks. There is still time for people to speak out in support of the postal service.